Ink spills on wood furniture can be very difficult to remove especially if it penetrates the finish. Before you just grab the nearest cleaner make sure that it is safe for your furniture's finish. 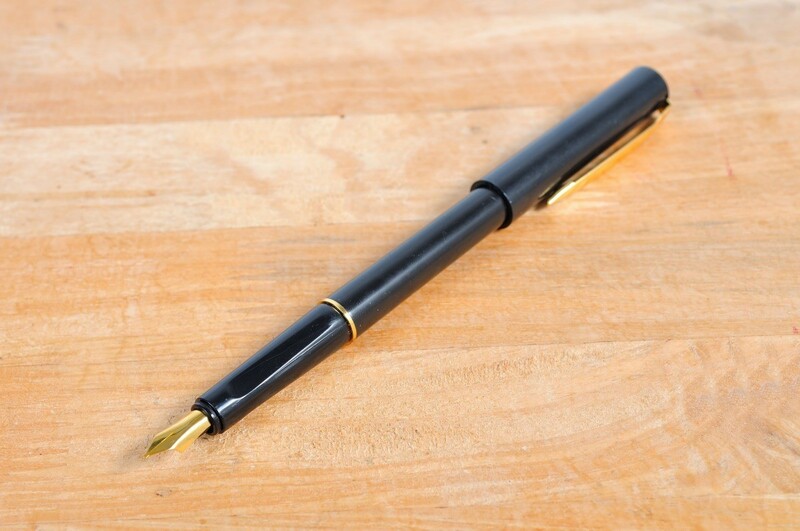 This is a guide about removing pen and ink stains on wood furniture. I followed the advice about using nail varnish remover and it worked beautifully. However, using Pledge afterwards did not seem to restore the varnish as I would have hoped. I tried olive oil instead and that did the trick nicely. It seems that nut oils have a lot of restorative qualities for wood. As an aside, try Brazil nuts for wood scratches - simply rub the nut along the scratch. I used an eraser sponge. All you need to do is make sure the eraser sponge is just damp and rub the area. Today, I removed felt pen marks off a varnished dresser; the marks had been there for over 15 years! 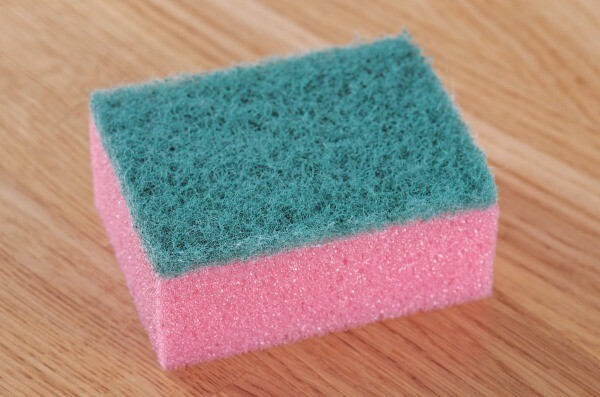 They looked black but after 10 minutes of rubbing, they were gone and my sponge had turned pink! Now all I need is my hair dryer or iron to remove the white water mark. Then, it will be a rub over with 3 parts oil and 1 part white vinegar. I have found this helps to cover up minor scratches and it will look as good as new. I have brought a bed and found felt tip pen all over the wooden part. Does anyone have any ideas on how to get it off? I've had great luck using rubbing alcohol to remove most felt-tip permanent pens. You could also use fingernail polish remover, but that may take of some of the stain or wood's finish. They make 2 types of fingernail polish remover. The kind make for artificial nails is the safest to try first. The kind not make for artificial nails is the strongest. Just use a Q-tip & make sure the solution doesn't drip. You may have to keep rubbing the Q-tip with alcohol back & forth. Sometimes it has to soak in a bit before it works & sometimes it works right away. Are you sure it's a permanent pen? Sometime water-color pens can look just like permanent pens & come off easily with soap & water. Well, it depends partly on how old and worn the finish on the wood is. I would proceed cautiously in case the varnish is thin; if you start removing the ink and it smears you don't want to make it worse by spreading it onto bare wood. Get a million q tips and some 90 per cent rubbing alcohol, at any large drug store. Most rubbing alcohol is 70 percent, but you can find the 90-91 percent. Have an old absorbent rag like a white t shirt also. Dip q tip into alcohol and wipe with upward stroke and blot spot [on wood] immediately. See if anything happens. If it does loosen ink, proceed but don't push cloth onto other areas without ink, just use a folded little bit on the exact spot and always use a clean piece of the rag, never one that's been stained with previously removed ink. Slow and carefully, until you get the hang of it. Alcohol could affect the varnish if it's an older varnish; not likely to if it's modern polyurethane. Others here may know a better method, but this is where I would start. If it doesn't work you have a nice bottle of rubbing alcohol, good for a lot of things and a new stash of q tips. Mr. Clean Magic Eraser! I had leaked red ink on my finished window sill. Normal scrubbing did not work, neither did the alcohol. In fact, the stains I tried alcohol on seemed to imbed deeper. I had tried Magic Eraser in the past, but it did not seem to work because I had not given it enough time. However this time, I started on one of the smaller stains and the difference was very noticeable. So I continued to scrub, and scrub, and scrub until it was gone! Then I moved onto the larger, more prominant stains. It took a lot longer, but they all disappeared as well. And all that scrubbing did not hurt the finish. Dish soap with a mildly rough scrubber worked for me. I was wondering if any one can help me? My dog got to a pen and it exploded and it's all over my furniture. I was wondering if there is anything to take the pen out? I feel your pain! My 2-year old did the same with a Sharpie. If it's wood, try alcohol - you can find very "strong" alcohol at Wal Mart - it is I think 91% and we applied it and rubbed the ink off with old rags. It worked pretty well on fabric as well, but prepare for a lot of blotting. If the surface is durable, a non-acetone nail polish remover worked as well in the same manner, but test it first and be prepared to rinse it out. Good luck! I have found that this works for both pen ink AND blood....Take a paper towel and fold it in fourths then lay it over the spot. Take regular hairspray and spray THROUGH the paper towel until saturated. You will see the ink being soaked up by the paper towel. Keep moving the paper towel to clean spots as it soaks up. DO NOT SCRUB! It might take several tries, but once the stain is faded you can use a carpet spot cleaner to finish it off. GOOD LUCK! A defective ballpoint pen left smudges of blue ink all over my oak desktop. I used nail polish remover (with acetone), putting a little on a paper towel and rubbing lightly, just enough to take the ink off. After I was finished, I polished the surface with Pledge and you'd never know anything happened. Any ideas on how to remove pen stains from wood without damaging the wood? I have a new built-in desk/shelving made from MDF polyurethane and my partner's ballpoint ink has now marked the desk top. Can anyone suggest how to best clean and remove the ink stains without scratching the surface? Try a Mr. Clean Magic eraser. Diluted rubbing alcohol on a cotton ball, circular motions. Please remember that your desk (made from MDF polyurethane) may not be waterproof - only water resistant - so use any liquid sparingly. Here is a link that might help but be sure to try anything on an underside first - just to make sure it will not damage the top. A Mr Clean magic eraser should do the trick. Just dampen it with a little water and rub off the ink. It should come off without scratching your surface. Your next best option is rubbing alcohol. 70% or 90% would work the best for this. 30% would still work but takes a bit longer and a lot more rubbing. Any advice on how to remove pen ink from very delicate wood without damaging the wood? Try making a paste of baking soda and water. Rub over the stain gently with a moistened soft cloth. Use a Mr. Clean Magic eraser to remove the ink from the delicate wood. 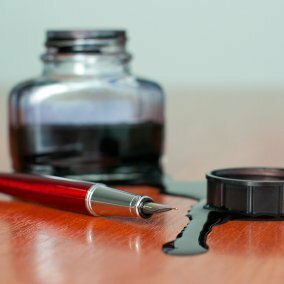 If it needs any perking up after the ink has been removed, make a mixture of 3 parts oil and 1 part white vinegar, dampen a cloth in the mixture and wipe it over the area. several things you can use and I would try with the least caustic first and work up ... mayo.... baking soda.... rubbing alcohol and nail polish remover...and something like comet cleanser.. with the more caustic, I use the end of a cotton swab...and try to just hit the actual mark.... rinse and wipe well..
How do I get ink pen off of solid oak furniture? Care needs to always be taken when removing stains from wood furniture. The products used could damage the finish; pretest solutions in an inconspicous location. This is a page about how to remove an ink stain on wood furniture. My child got a red paint pen stain all over my cherry wood desktop. I can't get off? Any ideas without ruining the wood?